Typesetting before TeX and computers? I was wondering how did mathematical and scientific books got typeset before TeX? I see lots of papers from the 50's and 60's (on IEEE for example) running more than 20 pages long, with tons of complex equations and references. Yet they still look very neat and accurate (to some extent). How did it work back then? actually, there was setting of math with computers before tex. very specialized, and usually quite expensive. in what follows, "symbol" is used to mean either a letter of some alphabet, a digit, or some other shape. hand-set type -- anything before the late 1800s. monotype -- several patents from 1885-1890 covered this system and its basic operation for ordinary text. the wikipedia article covers this pretty well. what it doesn't mention is the "4-line system" that was required for math. this is described in daniel rhatigan's m.a. thesis. this is the system used to compose the first editions of the first two volumes of knuth's "the art of computer programming", and it was the switch away from monotype that is the reason that tex exists today. "typewriter" composition. actually, this is an oversimplification. the "direct type" methods were of two distinct kinds. both were best used on machines with a carbon rather than an inked ribbon. traditional one-symbol-per-key typewriters. an "ordinary" typewriter has keys linked to type bars containing usually two symbols, with a "shift" key to change from lower to uppercase. any symbol not on one of these type bars had to be added by another method, either by hand or by the use of a widget called a "typit", a plastic device with a raised symbol at one end that could be stuck into a guide mounted on the typewriter where a key would impact the ribbon, and any key could be struck to impact the typit and transfer the image of that symbol to the ribbon and paper. typits were used on machines with either proportional or fixed spacing. a machine with interchangeable "fonts". i know of two kinds used for direct manual input. the "varityper", had a revolving drum onto which two semicylindrical fonts could be mounted, allowing both latin and greek (for example) to be available at the same time. switching one font for another was reasonably fast, and the use of proportional spacing resulted in an appearance that was more refined than possible with a monospace typewriter, but not nearly the quality of real composition. 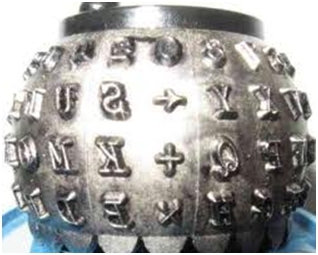 the ibm selectric and "clones" used a "golf ball" mechanism. these type units were easy to switch, although only one "font" (containing the same number of symbols as keys on the keyboard, times however many shift keys were provided) could be in use at one time. photocomposition was the next advance. i know of one direct-input photocomposer used for math -- the photon 200. a keyboard with several automobile-like shift levers controlled the input. images of symbols were transparent shapes on a glass disk otherwise coated with black, like a photographic negative. for "pi" symbols not on the disk, there was a "whirligig" with eight arms, onto each of which could be mounted a photographic negative of one symbol; jobs had to be carefully edited beforehand to make sure that no more than the eight available pi symbols would be needed, since changing the pi set in the middle of a job could run the risk of exposing the output medium, which would mean starting over. there was sufficient computer power in this machine to calculate line length and apply justification (in text), but for the most part, such decisions for math were manual, and required a highly skilled operator. output devices varied in how images were transferred to the photographic medium. the photon 713 had a cylindrical drum into which were mounted 35mm film strips, each with about the equivalent of what would fit on a selectric golf ball. there were 16 of these fonts, so the available collection included roman, italic, bold, greek, and a reasonably comprehensive collection of math symbols. the drum rotated at high speed, and the images were set by a carefully timed strobe while the disk assembly was advanced across the width of the paper by an absolutely gorgeous worm gear. crt output was another possibility. these devices were originally devised for use by newspapers, where speed was essential, and cost secondary. the imaging process usually involved moving a crt beam along a predetermined path, turning it on and off as appropriate. the symbols in fonts were designed by hand, which involved defining the paths for the beam. only certain directions were possible -- vertical, horizontal, and at 45 degrees, but one of these was not permitted (i've forgotten which), so it was necessary to make sure that a symbol could be completed in a single, continuous path, avoiding the proscribed direction. one other essentially non-commercial typesetting system deserves mention -- troff -- which, with its companion eqn was created at bell labs and available on unix systems from the early 1970s, but which originally produced typeset output only on the cat typesetter, and was freely available only to unix sites. this review has gone on long enough. if anything significant is missing, or any errors are noted, please let me know, and i'll try to remedy the situation. As PhD students at the time we had to type our work on an IBM typewriter. This meant that when you got to equations you had to change the typewriter head, that looked like a golf ball, so don't complain about font changing commands in LaTeX. One advantage with this arrangement was that one became economical with words and more careful with spelling and writing. Luckily TeX and LaTeX appeared and I moved onto using LaTeX when the LaserJet 1 appeared. 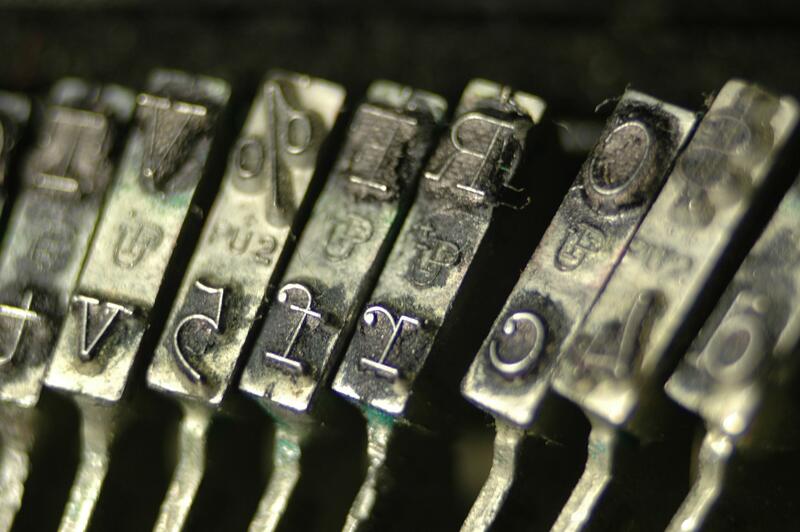 Many old books were typeset using typewriter with some symbols written by hand. Also, changing the font they could type Greek letters. In Germany, immediately before the arrival of LaTeX, a WYSIWYG program called SIGNUM (by Application System Heidelberg) on the Atari was quite popular for writing math and sciences. The program only died out when the supply of Atari computers ended---it had its fans despite being inferior to TeX in almost any aspect. Here's the only Amazon review, from 2005. For a long time, this was the most thorough description in English of math typesetting. Rather than giving long lists of rules, it is an engagingly written essay. However, its concerns are not those of today's typesetter. In every section, the authors stress the need to consider the economics of each choice. That no longer matters, since with computer typesetting, layout can be chosen purely on aesthetic grounds. Read it for historical interest, but for practical guidance get the Chicago Manual of Style or Mathematics into Type. In response to @Johannes_B : I recommend this as a fun read if you can locate a copy. There would be no point in advertising an out of print hard to find book. This is somewhere inbetween nostalgia and an answer. If you look at many papers and pre-prints from the University of Chicago into the late 70's, they usually thank Fred Flowers for typing the manuscript. There was a very expensive special purpose IBM machine for mathematical typing in the department. It was Fred's full time job to type mathematics on it. How can I explain the meaning of LaTeX to my grandma? Is this an originally typeset paper from 1946, or a new remake with TeX? How was maths formatted before LaTeX? Where does the name “TeX” come from? Does the TeX lion mascot have a name? Is NTS (New Typesetting System) (the Java implementation of TeX) usable today? Did Knuth's wife have a role in TeX creation?